WEDNESDAY, March 4, 2015 (HealthDay News) -- People who are fit in their 40s seem to retain more brain volume two decades later and also perform better on decision-making tests, new research suggests. The analysis of more than 1,200 participants who were tracked for more than 20 years showed that those with lower fitness levels at midlife had smaller brain volumes in their 60s -- a sign of accelerated brain aging. "I think many people will be surprised to learn that their fitness levels at midlife may impact brain health as they move into older adulthood," said study author Nicole Spartano, a postdoctoral fellow at Boston University School of Medicine. "We were not surprised by these findings because there is growing evidence that many behaviors and risk factors in middle age may have consequences to brain health in later life." Spartano was scheduled to present her research March 4 at an American Heart Association meeting in Baltimore. Studies presented at scientific conferences typically have not been published or peer-reviewed, and results are considered preliminary. For the study, just over 1,270 people underwent exercise treadmill testing in the 1970s, when their average age was 41. In their 60s, the participants underwent MRI brain scans and mental performance tests. Those at midlife who had experienced a greater increase in heart rate or diastolic blood pressure after a few minutes of low-intensity exercise on a treadmill -- signs of lower fitness levels -- had smaller brain volumes later in life, Spartano and her colleagues found. Higher heart rate and blood pressure during exercise are indications of lower overall fitness levels and can also damage small blood vessels in the brain, the study authors explained. Similarly, those with larger increases in blood pressure levels during low-intensity exercise performed worse on a mental ("cognition") test of decision-making ability in their 60s, the study found. Every 7.1 mm Hg rise in diastolic blood pressure (the bottom number in a reading) and additional 8.3 beats per minute in heart rate over participants' resting levels were equated with an additional half-year of brain aging, Spartano said. "In elderly individuals, improvements in fitness have been shown to prevent brain aging over the short-term," said Spartano. 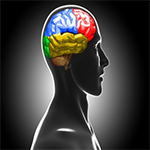 "But it has not been clear whether fitness throughout adulthood has an impact on brain aging. In particular, it has not been clear how longstanding (or short-lived) an impact midlife fitness might have on late-life cognition." Dr. Joseph Masdeu, director of neuroimaging and the Nantz National Alzheimer Center at Houston Methodist Neurological Institute in Texas, praised the study's design, because data was collected over decades and not subject to misreporting of personal fitness levels. He and Spartano agreed that factors other than fitness may have influenced the findings, and that those with better diets and other lifestyle habits may also be more likely to experience better brain health at older ages. "This study cannot prove causality, because it's possible that people with brain changes making them more likely to get Alzheimer's are going to be less prone to exercising," Masdeu said. "You cannot prove that exercise is what did it." Spartano said she could not recommend an optimal level of fitness to achieve better brain aging based on the study results. But, people should strive for exercise "that will get the heart pumping every day," Masdeu suggested. "It's hard to give a quantified amount of exercise," he acknowledged. "We are not telling people to run marathons. It's a good idea to do some aerobic exercise that gets the heart pumping, such as half an hour of walking every day, or going up several flights of stairs." Since study participants are still being tracked for health outcomes, Spartano said it will be interesting to see in another decade how many develop dementia, and whether the dementia rates could be tied to fitness levels at midlife.